In Treasures of Africa, the author lays out an evocative mosaic of photography, showcasing the signature wildlife, spectacular birdlife, diverse eco- systems and getaway places captured from his travels and journeys across Africa. He postulates that the real riches don’t lie in gold, diamonds and platinum, but it’s the continent’s wildlife and wilderness areas that are the irresistible magnets. But like any imagery associated with treasure, it is always open to the scheming and plundering from unscrupulous people and international syndicates, motivated by commercial greed and exploitation. It is a sobering reality that this collection of “natural riches” in almost every National park and private game reserve across the continent is continuously at risk to the scourge of poaching that is impacting Africa’s wildlife legacy. The author has weaved into the introduction some of the harsh facts and figures relating to the escalating “scorecard” of poaching and chronicles the devastating statistics of rhino and elephant poaching in a number of regions. 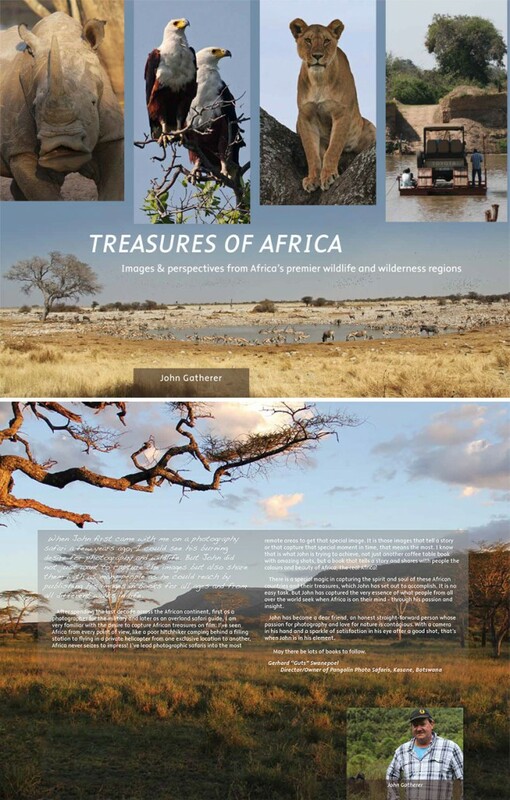 The publication is primarily a photographic collection of African wildlife, but there is an underlying appeal that one must never lose sight of the colossal protective efforts, strategies and global awareness required to preserve Africa’s heritage from the criminal world of poachers and opportunistic mercenaries.